Thomas Eakins’s deep connection to his birthplace remained a theme throughout his career. Perhaps his most well-known and ambitious work for the city of Philadelphia is The Gross Clinic, a painting completed in 1875 that spotlights the local physician Samuel David Gross. The scene depicts Gross overseeing a surgery and lecturing to a class of medical students—evoking Rembrandt’s art historical precedent The Anatomy Lesson of Dr. Tulp (1632). Much like Rembrandt’s version, The Gross Clinic documents medical sanitary procedures of its time, but the painting’s real focus are living figures. 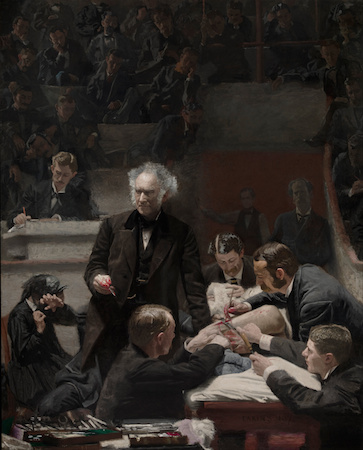 Always a portraitist, Eakins calculated the work as a visual record of all the individuals present in the medical amphitheater. It is not solely a portrait of Dr. 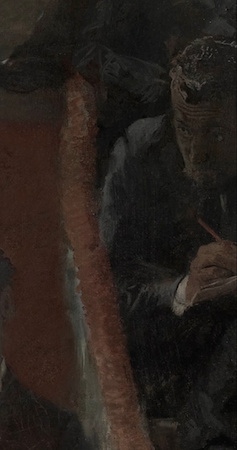 Gross; in addition to including the students and the assistants, Eakins inserted his own likeness among the audience – he’s the figure at the far right, sketching (one might consider Eakins the Alfred Hitchcock of nineteenth-century American painting). The core of the work is still Dr. Gross, however, as light and composition conspire to attract the eye to the esteemed lecturer. Completed for the Centennial Exposition, Eakins intended The Gross Clinic as a statement of his artistic skill and as a way in which to affirm himself as a hero of Philadelphia. Though the work was rejected, the tactic was overall a success. While some critics lashed out against its gruesome subject matter, seemingly vulgar treatment, and inherent melodrama (note the near-swooning, hysterical woman in the left middle ground), viewers were nonetheless captivated by the work’s theatricality. Through his mastery of rendering convincing volume, individual representation, and psychological intensity, Eakins showcases his academic training and—in a style that has been dubbed “scientific realism”—reveals an uncompromising desire to portray honest details of form, depth, and proportion. He was obsessed with accuracy, and was known to project photographs onto canvases in order to laboriously trace figures though also to shift objects for a more harmoniously composed scene. 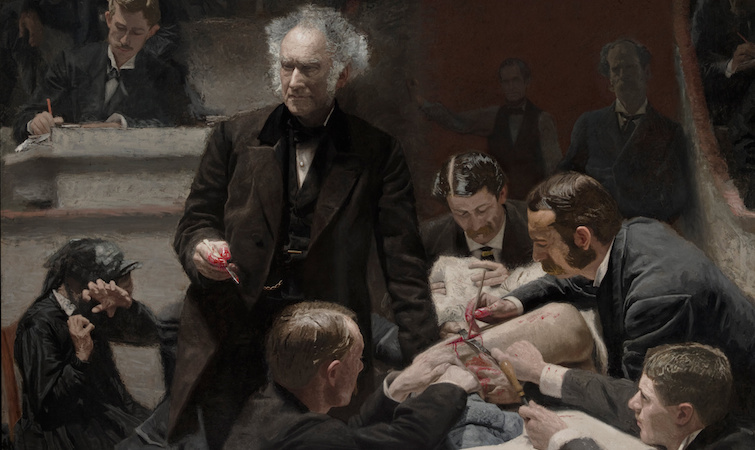 After The Gross Clinic’s exhibition at the U.S. Army Post Hospital—in a first-aid room meant to introduce viewers to modern medical paraphernalia—the Jefferson Medical College (where Eakins himself had taken anatomy classes) was given the painting by an alumni. A reproduction now hangs in the school, which sold the original in 2006. The work was considered so central to the history of Philadelphia, however, that the city’s two major art museums successfully rallied support to keep the tour de force in town with an ambitious fundraising effort that proved the work’s enduring value and underscored the fact that cultural artifacts can ignite complex debates. In closing, it should be noted that The Gross Clinic is not the only such medical scene Eakins produced. He later returned to the same popular formula to honor the surgeon David Hayes Agnew in a similarly composed (and equally controversial) work entitled The Agnew Clinic (1889), also on display at the Philadelphia Museum of Art. Cite this page as: Meg Floryan, "Thomas Eakins, The Gross Clinic and The Agnew Clinic," in Smarthistory, August 9, 2015, accessed April 20, 2019, https://smarthistory.org/eakins-the-gross-clinic/.